So blog number 2! Thank you so much to everyone who read and shared my first blog. I hope you enjoyed reading. Please do take the time to share this one too. 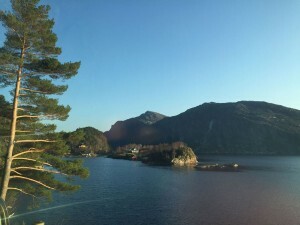 I’m currently in Førde, in beautiful western Norway on tour with the trio. It’s our 3rd schools tour out here. The Norwegian government have got it right over here. Each child is entitled to see a certain number (I can’t remember how many exactly) of professional concerts/shows in their school each year. It’s a fantastic scheme and we feel so privileged to be part of it. I wish Scotland had the same. It’s kind of back to front to normal touring. We have early starts, but our shows (normally 2 a day) are finished by 1.30pm each day. So, unless we’re travelling, we have every afternoon and evening off. We’re here for 2 weeks and we also have the weekends off which is great. It means that we can really relax and also get on with other personal projects, work and practice while here. Anyway, back to the subject of this blog… the process of recording the next (yet to be named) Rachel Hair Trio album. We’re currently looking at having 11 tracks on the album. Because we’re not a full time working band, this time round, we’ve ended up working on new material specifically for the album really since May. So it will be totally new material on the album… never heard before at any gigs! In the past it’s mostly been myself that has sourced out material for what we play, but this time round it’s been a bit more of a group effort. I’ve been doing a lot of writing so there’s a good number of my own tunes going to be on it. Tune writing comes to be in a variety of different ways. Sometimes I’ll just write a tune, because I want to, other times I’ll be writing tunes in a certain style to fit in with a set that we already have. In those situations, as a trio, we’ll be looking for a certain vibe, sometimes even a certain key and I’ll write to suit that situation. Some of my tunes already have names as I had some names and situations that I knew I wanted to pair tunes to. Others don’t though so if anyone’s got any ideas let me know! I’ve also wanted to include a number of tunes which reflect what I’m really about and my background as a musician. I love delving into the old collections of North-West Highland music, as it’s where I grew up, and so much of that style is engrained in me. The Captain Simon Fraser collection has been a wonderful source for me so I’ve spent a good number of hours playing through tunes in his first and second volumes. I’m loving a strathspey from it, which I haven’t heard anyone play before, so that will be making an appearance on the new disc. I’ve been spending many years journeying back and forth to play and teach music on the Isle of Man so it would be wrong not to have a Manx tune or two on the album this time, as Manx music is a big part of my life now. It’s a style I guess which reflects it’s geographical position, in the middle of the Irish sea between Scotland and Ireland. Jenn is constantly on the pulse of what’s going on in the music scene of Scotland and as a result of this we’re going to be including a tune of a friend of hers who’s involved in the jazz scene but has been known to dabble on the accordion! Jenn will also be singing some songs on the album so we’ve been working on both some trad and more modern songs for it. As a youngster Jenn followed her folks round many of the English folk festivals so she has a wealth of songs from this and from her dads record collection. Cammy has recently come back from “Distil”, a weekend described as “a gathering of musicians rooted in folk and traditional music, but who are interested in expanding their creative horizons into other other areas of musical practice”. He really came back inspired and challenged and as a result has been doing some writing. I’m chuffed to say we’re going to be recording one of the pieces he’s written as a result of this. It’s pushed us quite a bit in rehearsals as it’s not straight trad style timing. It’s good to be challenged though, and the piece still sounds natural to our ensemble. Thought I might tell you what I’ve been listening to as I’ve been writing this blog.